Everybody’s heard of Whistler, British Columbia. Fantastic skiing, great golfing, and soon a player on the world stage as host to several of the Vancouver Winter Olympics events. It’s a place lots of people visit, with many buying into the Whistler dream, purchasing a property, and becoming some of the resort’s best ambassadors. WHISTLER HAS A long history of providing lifestyle pleasures.Whistler Mountain officially opened for skiing in 1966, and Blackcomb Mountain in 1980. In 1998, both mountains merged under Intrawest Corporation. Intrawest, based in Vancouver, is one of the World’s largest all-season resort developers and recreational lifestyle companies. Since its humble beginnings, Whistler has evolved into one of the premier all-season international resorts. WIDE RANGE OF HOUSING OPTIONS Why is Whistler so hot? The spectacular scenery is one reason. The infinite variety of outdoor four-season recreational pursuits is another. The quality of lifestyle and proximity to Vancouver are other influencing factors. Investors find Whistler appealing due to its positive international reputation, activities and amenities, and the types of housing options available.Approximately 85 per cent of buyers are second or third time property homeowners. About a third come from the Greater Vancouver area, followed by the U.S., rest of Canada, rest of B.C., then the UK and Asia. Buying a property at Whistler is not just for the rich. According to Heather Clifford of The Whistler Real Estate Company, there is a wide price range, from the modest to the super luxury from $150,000 to over $5 million. In addition to vacant land, there are houses, apartment condominums, and townhomes, as well as properties that you can buy with a fractional interest; for example, a quarter share or other equity share of the property. This fractional interest option is attractive to people who only wish to use the home certain times of the year, but want to have a partial investment in Whistler, and possibly rent their time portion when not in use. Every real estate market goes through cycles of course, and each segment of a market can be in different cycles. Currently the Whistler market is slower than it was several years ago, due to many variables such as the exchange rate with the U.S, and general reduction in travel by Americans. Therefore it is a good time to buy. However, these factors are always in flux, and people adjust to changing circumstances. You will find there is a healthy mix of new and re-sale properties available at all price ranges. With the fast approaching 2010 Olympics, there is a massive upgrading of the Sea to Sky highway, making access even easier. There are many other influences that contribute to the desirability of many to own recreational property. 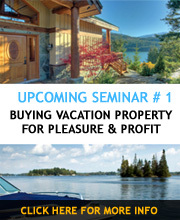 Examples include the trend for aging baby boomers to want a second property in an all season resort area for lifestyle and investment purposes, the passing of trillions of dollars in inheritance to boomers over the next ten-plus years, and the desire for many people to own a tangible commodity like real estate to diversify their investment portfolio, especially given the historical average increase in real estate over the last 40 years in Canada. The current sense of risk or unease associated with the stock market, as well as the prevailing low interest return on fixed terms deposits, tends to drive many to consider real estate. People feel comfortable with the concept of real estate as a solid investment. The low interest rates for mortgage money that we have been enjoying for some time is also a catalyst for buying property.There are other factors that make investing in recreational and resort real estate attractive. The federal Canada Mortgage and Housing Corporation (CMHC) has recently changed its policies to allow borrowers for recreational property to obtain the same type of highratio financing as for their principal residence. This is because CMHC has determined that many Canadians consider this type of second property option important for their lifestyle and quality of life. Whistler’s proximity to Greater Vancouver means a larger buying pool for re-sale purposes thereby protecting property values over time. The buoyant economy and economic optimism in the province are also important factors when considering market stability. As Whistler has a bed cap limit imposed by the municipality, it means the amount of remaining development is restricted and limited. The law of supply and demand will work its wonders. Intrawest is spending large sums in constantly upgrading Whistler infrastructure and enhancing the quality of the visitor experience. If Whistler is out of your price range, you may wish to consider buying in the neighbouring communities of Squamish or Pemberton. Squamish is a 40-minute drive south of Whistler, and is enjoying a housing boom due to its ideal location half-way between Vancouver and Whistler. Pemberton is a small community about a 20-minute drive north of Whistler. Both are situated in scenic mountain settings. The real estate offerings in both Squamish and Pemberton consist primarily of condominiums, but there are also new and re-sale houses and townhomes available. Prices have increased substantially over the past five years due to their proximity to Whistler and relative affordability. MORE HELPFUL INFO FOR YOUR RESEARCH ! To help your research and save you time and hassle, check out our free checklists and forms on our "Worksheet" section, as well as the stats, surveys, and reports, useful links, etc, on our "Helpful Info" section, both shown on the index on your left. Copyright © 2019 , Douglas Gray, LL.B. All rights reserved. Any reproduction of the material contained in this website is strictly prohibited. E&OE (Errors and Omissions Excepted). Please refer to Copyright and Disclaimer at bottom of website page. Refer to Books section for related information. Medora - Vancouver Web Designer Copyright © 2019, Canadian Enterprise Group Inc. All Rights Reserved.